It was simply a question of deciding whose dress could best be handed on to which younger sister. 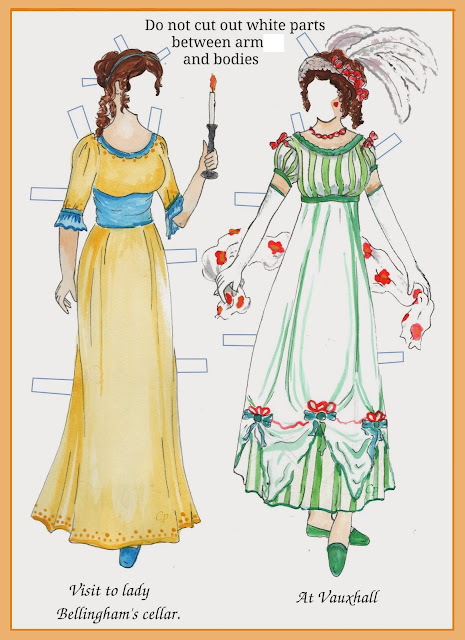 Thus Ann became possessed of Karen’s last year’s yellow taffeta; Lawrie inherited Ann’s blue silk, once Rowan’s, which was, unexpectedly, too short for Ginty, but could easily be turned up and taken in for Lawrie; and Nicola, to her dismay, found herself trying on Ginty’s white net with frills, once Karen’s and later Ann’s, which fitted so well that protests were pointless. Eying herself disgustedly in the cheval mirror, Nicola came to the grim conclusion that whatever sort of face she had, it wasn’t a white net with frills one. observations: The section on the Twelfth Night party and dance in this YA book could alone provide a week’s worth of entries – there are more dresses to find in this scene, a dress that is going to be made over (and Nicola wondering glumly if she is or is not the only one looking terrible) and later the introduction of something called The Bridesmaid’s Horror – ‘a tradition had grown up concerning its utter ghastliness and complete unwearability’ – and then the surprise outcome regarding the madeover dress. And in another book in the same series, Run Away Home, the Twelfth Night party will happen again, with more clothes panics of a different kind. There is one important question: Lawrie and Nicola are identical twins, so it is not clear why the two dresses have to be divided up the way they are, why cannot Lawrie wear white net with frills and Nicola the blue silk? You might think from the above that the series of ten books about this family, which roughly divide between school activities and home adventures, is obsessed with clothes, and this is far from the case – they feature, they are important to the girls of the family, but there are many other interests. Peter’s Room follows the group of teenagers as they play fantasy games in a cold snowy landscape, and this is matched with research into the similar games of the Bronte siblings at Haworth parsonage in the first half of the 19th century. And two of the sisters have competing friendships with Patrick Merrick – one of the hosts of the party – a situation that will not be resolved until the second Twelfth Night party a year later, when a cream silk dress comes into play. But in between there will be much upset, stolen phonecalls and trouble at school. It is all much much better than this makes it sounds. In two earlier entries – here and here - I tried to explain the attraction of the books, which have a small fanatical group of followers. 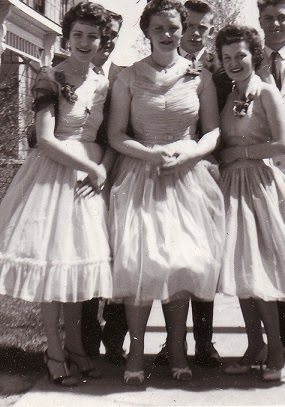 The young women in the photo are going to a teenage dance party in Canada in 1959 – picture from the Desoronto Archives. "The young women in the photo are going to a teenage dance party"..........are they gatecrashing? With the possible exception of the one in the middle they all look so much older. Not one for me - well done again! Oh dear... I don't know if it's being a Canadian that caused the wince reaction or just having looked at the "OMGthatdress" blog which has a series of Dior dresses from the '50s. As my mother would have said... "You're not going to a party wearing THAT, are you?" We don't really have a "non-u" usage here, but buying evening dresses from the Eaton's catalogue (a popular mail-order department store) should have been enough to start one. (started to answer this, then went off to look at OMGthatdress and have spent half an hour there, what an amazing blog). The girls in the picture - well, they obviously feel they've done their best, there's no hint of shyness or lack of self-confidence is there? Lawrie has a way of making life difficult for others if she doesn't get her way. Nicola is probably being sacrificed by the others to ensure a half-way bearable evening at the very least. I have five older girl cousins and spent a lot of my childhood in ten year old pass me downs, so can sympathise with Nicola! How nice to hear from someone who obviously knows the books well - the relationship between Lawrie and Nicola is very well done. I don't think party dresses would be passed down like this in a well-off middle class family these days, what do you think? My younger niece wears party dresses (and other clothes) passed down from her 3 years older sister - their father is a well paid professional and probably better off than my parents were at the same stage. That said, the Marlows are clearly socially a few notches up - said nieces got to the local primary and will never be attending a school like Kingscote and I suspect Captain Marlow has some "private income" from investments. I see them as more lower-upper class in some ways than middle class - maybe upper middle at a push? My younger cousin, who had the dresses after me as a child, buys her children new clothes but then she has one of each. The only clothes she ever had new were her knickers and school uniform, I think. Party dresses survive being passed down best - less likely to be worn out and often no elbows to wear out. It's such an interesting little sociological topic - I think now would questions of fashion come into the party dress area? There's never a hint that any of the girls could object to a dress on those grounds. And, poor Lawrie and Nicola wearing a different colour uniform from everyone else.... Upper middle is probably a good guess, but still, as you say, not as much money and luxury as a much more down-market family these days - and servants and private schools. I always wondered what Mrs Marlow did all day - Mrs Bertie and Doris did the cooking and the children seemed to do the other chores. Moira: Now those are fancy dresses. The older girls were wearing them when I was a pre-teen. A few days ago I agree I should have said a costume ball as you suggested. I wasn't saying you were wrong, I just wondered if Canada went with US or UK in this instance! I'm glad you recognized these 'fancy' dresses as they are Canadian..
Maybe my childhood and teen years were too painful but I am not inspired to read about those things. I actually had a "happy" childhood and wonderful parents, but was very shy. Among other things.